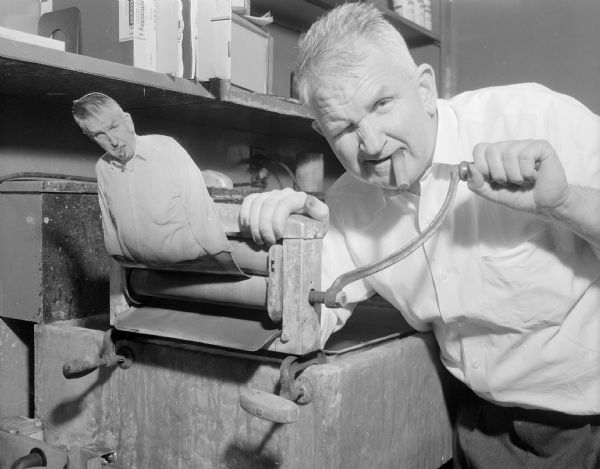 Sid in darkroom with a cigar in his mouth, rolling a miniature, printed cut-out version of himself through a photographic print wringer in a darkroom. Sid is winking at the camera. This image is issued by the Wisconsin Historical Society. Use of the image requires written permission from the staff of the Division of Library-Archives. It may not be sold or redistributed, copied or distributed as a photograph, electronic file, or any other media. The image should not be significantly altered through conventional or electronic means. Images altered beyond standard cropping and resizing require further negotiation with a staff member. The user is responsible for all issues of copyright. Please Credit: Friends of Sid Boyum, courtesy of the Wisconsin Historical Society.